میزان ملی‌گرایی مصرفی و ترجیح کالاهای داخلی بر کالاهای خارجی، از عوامل رشد و پویایی اقتصاد و بخش بازرگانی کشور محسوب می‌شود. در این شرایط، مصرف‌کننده بر اساس معیارهای هنجاری و عاطفی، کالاهای داخلی را در اولویت مصرف قرار می‌دهد و با تحریم خرید محصولات خارجی و غیر‌اخلاقی دانستن خرید چنین کالاهایی، تأثیر مثبتی بر اقتصاد داخلی کشور به جا می‌گذارد. مقاله حاضر، ضمن بررسی میزان ملی‌گرایی مصرفی شهروندان 28 شهر کشور به روش پیمایش، نگرش مصرف‌کنندگان را نسبت به کالاهای داخلی و تمایل به خرید این کالاها مورد بررسی قرار داده است. طبق نتایج این پژوهش، 83درصد از پاسخگویان بر اساس معیارهای شناختی و عقلانی اقدام به خرید کالا می‌کنند و تنها در حدود 14درصد، با توجه به معیارهای هنجاری و عاطفی کالاهای مورد نیاز خود را تهیه می‌کنند. همچنین ملی‌گرایی مصرفی 4/80درصد از کل پاسخگویان، در حد متوسط، 4/13درصد در حد قوی و 2/6درصد در حد ضعیف است. The mounting level of consuming nationalism, i.e. preference for domestically-made goods over foreign items is one of the decisive factors accounting for Iran's increasingly flourishing economy. Under such circumstances, consumers choose domestic goods based on normal and emotional criteria, and by refusing to buy foreign commodities and disdaining them as immoral, they help flourish the economy of their country. Using the results of a survey conducted in 28 provinces, the present paper investigates the level of consuming nationalism among citizens of these provinces and examines the consumers’ attitudes towards domestically-made goods and their preference for picking them up. The present paper also aims to study the level of citizens’ trust in domestic advertisements and its relevancy to consuming nationalism. Research findings indicate that 83% of the respondents do their buying based on cognitive and rational criteria, and only 14% buy their needs based on normal and emotional measures. Consuming nationalism for 80.4% of the total respondents was at medium level and for 13.4% of them was at high level and for 6.2% of them was at low level. آسابرگر، آرتور. (1383). روش‌های تحلیل رسانه‌ها (ترجمه پرویز اجلالی) تهران: مرکز مطالعات و تحقیقات رسانه‌ها. موون، جان سی و مینور، میشل. (1384). 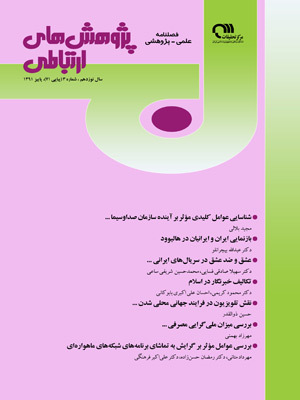 رفتار مصرف‌کننده (عوامل بیرونی) (ترجمه عباس صالح اردستانی). تهران: فارابی. Bakan, M.A. (2003). Marketing Demographic, Advertising Aemiotics: The Case of Aksam Newspaper. A Thesis Submitted To The Graduate School of Social Sciences of Middle East Technical University. Bettman, J.R. (1978). Information Processing Theory of Consumer Choice, Addison-Welsey. Day, G.S. & Wensley, R. (1988).Assessing Advantage: A Framework For Diagnosing Competitive Superiority; Journal Of Marketing, Vol. 52. Durvasula, S.; Andrews, J.C. & Netemeyer, R.G. (1997). A Cross-Cultural Comparison of Consumer Ethnocentrism In The United Statesand Russia. Journal of International Consumer Marketing, Vol. 9, No. 4,Pp.73-93. Hackley, C. (2005). Advertising And Promotion, Communicating Brands. London: Sage. Javalgi, R.G. ; Khare, V.P. & Scherer, R.F. (2005). An Application of The Consumer Ethnocentrism Model To French Consumers. International Business Review, Vol. 14, Pp. 325-344. Liu, F.; Murphy, J.; Li, J. & Liu, X. (2007). English and Chinese? The Role of Consumer Ethnocentrism and Country or Origin in ChineseAttitude towarde Store Signs. Australasian Marketing Journal, Vol. 14, No. 2, Pp. 5-16. Moon, B.J. (1997). Consumer Processing of International Advertizing: The Roles of Country of Origin Perception, Consumerethnocentrism, And Country Attitude. Ph.D. Dissertation, The University Of Connecticut. Nguyen, T.D. ; Nguyen, T.M. & Barrett, N.J. (2008). Consumer Ethnocentrism, Cultural Sensitivity, And Intention to Purchase Localproducts-Evidence From Vietnam. Journal of Consumer Behavior, Vol. 7, Pp. 88-100. Packard, V. (1957). The Hidden Persuader. London: Mackay and Company. Shimp, T. & Sharma, S. (1987). Consumer Ethnocentrism: Construction and Validation of the Cetscale. Journal of Marketing Research, Vol. 24. Sharma, S.; Shimp, T.A. & Shin, J. (1995). Consumer Ethnocentrism:A Test of Antecedents And Moderators. Journal of The Academy of marketing Science, Vol. 23, No. 1, Pp. 26-37. Watson, J.J. & Wright, K. (2000). Consumer Ethnocentrism Andattitudes Toward Domestic And Foreign Products. European Journal of Marketing, Vol. 34, No. 9-10.